Teff hay is typically less than 10% non-structural carbohydrate on an as fed basis. The growing number of horse that are overweight and/or have metabolic problems, are prone to laminitis, PSSM (polysaccharide storage myopathy) or have other issues creates an increased need for low non-structural carbohydrate (NSC, starch and sugar), or low carb, diets. This can be achieved to some degree by cutting out most concentrates, but what about the hay? Most people think of hay as the long stem fibrous stuff that a horse needs to eat, but tend to forget about its real nutritional value, and its potential to contribute greatly to the NSC intake of the horse. Data suggests that horses with sensitivities to starch and sugar should consume diets with less than 12% NSC overall, and ideally even less than 10% on an “as fed” basis. In fact, any horse with a high risk or previous laminitis should be on hay less than 10%. With hay making up the majority of a horse’s diet, getting that low NSC hay is a priority and can be challenging – how do you know how much NSC is in your hay? The only way to know 100% is to have it tested. I’ve seen hay that looked stemmier and lower quality, that I presumed was lower in NSC, get tested at 15% NSC. Based on Equi-Analytical’s database of more than 17,000 hay samples over 16 years shows an average NSC content of 11.8%, with the normal range going up to 16.2% on an “as fed” basis! While an “as fed” analysis includes water content, a “dry matter” analysis excludes the water which is helpful when comparing hay to pasture. Using a “dry matter” comparison from the same database, there is an average NSC in grass as 13.0% with an upper range of 20% on a dry matter basis (vs. 12.8 and an upper range of 17.6% on the dry matter basis for hay). People tend to be wary of their grass for horses with sugar sensitivities, but they should not overlook their hay. So what does an owner do? I always recommend getting hay tested. It isn’t that expensive, and it can also tell you about the protein and mineral content of your hay, which can help with ration balancing. And if you have a horse that is prone to laminitis, it is the only way to be 100% certain. There are some types of hay that tend to be low in NSC naturally; for example Teff hay is typically less than 10% NSC on an as fed basis. Alfalfa and other legumes tend to be lower in NSC, but are also higher in protein, and that can be problematic for some horses. 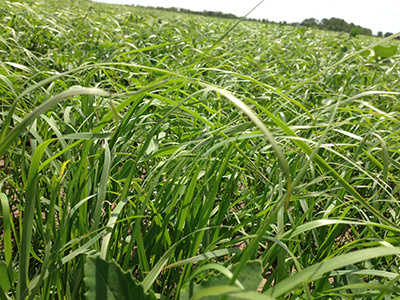 Orchardgrass, Timothy and Ryegrass hay tend to have the highest amount of NSC. There are more and more hay producers looking to produce lower NSC hay, and many will provide an analysis before you purchase it. Other websites that list hay producers may indicate which producers make lower NSC hay, such as www.lowcarbhorsehay.com. *Please note I have no financial interest in this website, and in particular I have a strong pet peeve about the name – because ALL hay is VERY HIGH in carbs! Fiber is a carbohydrate and horses need a lot of it! So “low carb” is technically incorrect. You can also look into some large-scale hay producers (eg. Stanlee Forage or Maaax Equine) that market directly to horses and find hay with less than 10% NSCU. Another alternative to decrease NSC in hay is to soak it, which I strongly recommend for horses at risk or have previous had laminitis (even after testing the hay). Soak the hay for 30 minutes in tap water and dispose of the (now sugar-logged) water. A simple and cheap way is to use two muck tubs, one with holes drilled in the bottom of it. Place the holed tub into another muck tub (with no holes) and put in the hay and cover it in water. After 30 min, just lift the top tub up, with the hay in it, and the water draining out of the holes into the bottom tub. Easy, effective and cheap! This can reduce sugars by 2-4% on average, but if you started high then the hay might still not be suitable for some horses.